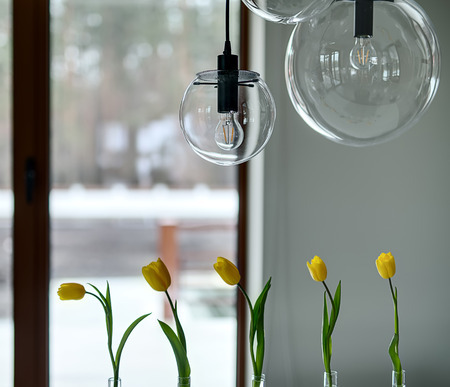 Dust, bugs, airborne cooking oils - it doesn't take long for these home-based interlopers to find their way onto your home's many light fixtures. Regular light fixture cleaning will ensure you get all that wattage you're paying for. These soils are dimming both your home's ambience and your fixtures' ability to put out all the wattage you're paying for. Now, the good news: Light fixture cleaning needn't be a supercharged effort. Regular once-overs with a rag or dust cloth, optimally whenever you do your regular house cleaning, but at least each time you change the bulb, will keep most of the grime from settling in for a permanent stay. First, adhere to the less-is-more adage when cleaning, especially if those manufacturer tags and information on the finish was recycled long ago. Next, always make sure the light fixture is off before you begin cleaning. To clean table lamps,sconces, and ceiling lights, carefully remove the shades, and clean them according to the type of material (see below). Wipe off the bulb and base with a damp cloth. Immerse ceiling-lamp covers in hot soapy water. Wash them gently, rinse, and dry. Finally, be sure to check for frayed wires before attempting any light fixture cleaning. If you notice any damage, have the fixture fixed before cleaning. Whether your fixtures are sconces or lamps, brass, glass or chrome fixtures, regular cleaning will keep them bright attractive pieces of your home's decor. Of course, each has its own challenges and special needs. 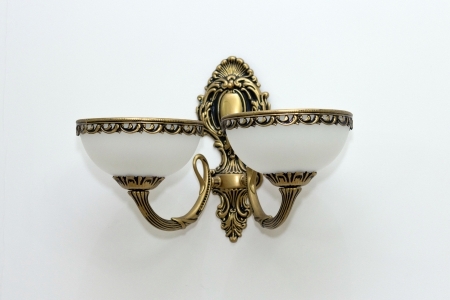 If you've skipped a few buffing sessions and your brass, chrome, steel, nickel, or pewter light fixture is looking a bit dull, resist the urge to lather on brass or other abrasive cleaners, which can mar the manufacturer-applied wax or sealer that keeps the fixture looking its best. Instead, gently rub the surface with a damp cloth. Or, contact the manufacturer or the retailer for specific instructions for cleaning your specialty finish. If your piece has been around for a while, that may not be possible, but these light fixture cleaning tips can help. For brass light fixtures without a lacquer finish, cleaning involves little more than wiping the surface with a damp cloth and drying with a soft cloth. Brass light fixtures with a factory-applied lacquer finish require only dusting and an occasional spot cleaning with a cloth dipped in warm water. Don't use any cleaner on lacquered brass; it can cause the surface to tarnish or become scratched. Wash glass fixtures by hand - never the dishwasher - to keep them clean and clear. Always wash by hand glass light fixtures by hand - not in the dishwasher. Overly enthusiastic cleanings and harsh automatic dish-washing detergent can scratch the decorative designs and coating on some fixtures. Plastic recessed lighting covers, commonly found in kitchen cabinet under-counter lighting fixtures, can be similarly cleaned in the sink with hand dish-washing liquid when the covers appear cloudy with cooking oils and dust. For hard-to-reach fixtures, a stepladder or an extended reach dust and dirt remover tool and a vacuum dust brush will keep fixtures looking clean and grime-free. And what about those dusty lamp shades? Simply use a vacuum cleaner to draw out the dust. It needs to be done often, as often as you dust and clean everything in your home. Finally, to keep shades from wearing out before their time, make sure you're using the correct wattage for the lighting fixture. Don't use more wattage than the fixture can take. In a lot of cases, manufacturers put some sort of limit as to wattage. Too much wattage can burn the shade. If you're unsure as to the wattage, opt for a lower wattage bulb to save energy. Since energy for lighting can account for up to 10 percent of your electric bill, you can save your lamp shades and your pocketbook by lightening up on your wattage. If you're using 100-watt bulbs where 60-watt bulbs will do, consider replacing them. Or, switch to fluorescent bulbs. The newer ones give off a warmer light that's close to the light of incandescent bulbs.